I decided to study Agribusiness in Australia as a pathway to expand my agricultural production knowledge and build on experience I gained back home in Zimbabwe. Studying agribusiness abroad would be the best way to learn global agriculture dynamics and transfer the knowledge back home. I am happy to be studying alongside budding, ambitious and like-minded Australians who are passionate and tuned into agriculture. The mixture of farming backgrounds at the college has added value and quality to the educational experience. The course delivery is from an in-depth industry perspective which makes the course relevant to the outside world. The flexibility of the course structure, delivery and access to facilities has allowed me to study and still nurture my small family. The study tours of China, Hong Kong and New Zealand capped off the whole study experience. Marcus Oldham is a small community with significant outside influence. The great sense of community, comradery and heritage made it easy to settle in, network and be part of. Meeting students who came from all across Australia has been a natural introduction to the diversity of the country. Marcus Oldham has brought out my ability to adjust to new environments and social settings and to find a niche role within any group. The best way to enjoy the Australian culture is to get involved and have a go. In amongst the multicultural array of the country, I have experienced the complexity of many regions through travelling, the rich natural landscape, the great outdoors and the sporting culture of Australia. With a year to complete the Bachelor of Agribusiness, I hope the refined business skills will propel my career further. Currently, I am the Assistant Mushroom Grower at Parwan Valley Mushrooms, Victoria. Studying abroad gives a different perspective on past experiences and natural knowledge. The moment you step out from your doorstep you open yourself up to the world. Studying abroad is an excellent opportunity to see a different way of doing things and create memories for life. There is a lot to learn and remember you also have just as much to offer. “I chose The Gordon because I wanted to study Diploma of Community Services Work and it is the only place in Geelong that is accredited by ACWA (Australian Community Workers Association). I love being a student at The Gordon! We have very passionate, skilled and experienced teachers who challenge and empower us at the same time – to learn more, to research, and to build up our strengths and skills to become better workers. Back in 2013, I was faced with the task of choosing a suitable university for my undergraduate studies. I heard about Deakin University through the pathway program offered at the Royal Institute Colombo and I decided to study at Deakin because it is one of the most well-known and reputable universities in Australia. Deakin University is also known for its engineering courses and facilities, which persuaded me to embark on this adventure. As part of the pathway program, I completed the first two years of my degree at the Royal Institute. Then I transferred to Deakin in 2015 for my final years, undertaking a Bachelor of Mechanical Engineering (Honours) at the Geelong Waurn Ponds campus. From childhood, I always had a passion for engineering. After high school, I tried taking a different path by doing an internship at a bank, but the experience was uninspiring and pushed me further towards engineering. The experience I have gained by joining Deakin as an engineering student is inexpressible. Deakin’s cutting edge technologies, featuring the most current and advanced lab equipment in the engineering department caught me by surprise from the very beginning. Deakin’s cutting edge technologies, featuring the most current and advanced lab equipment in the engineering department caught me by surprise from the very beginning. When I moved to Australia, I was having second thoughts about living all alone in Geelong, where my Deakin University campus is based. I lost my father when I was three years old, and was raised by my mother for 20 years along with my sister. But after arriving, I found Geelong and Australia to be very welcoming and started embracing my life here. I was rather nervous during the orientation week at Deakin, but the people I met during orientation made me feel like I was no longer away from home. Studying at Deakin has been an invaluable experience, and it has taught me how to develop my thinking and to take everything into consideration. One of the things I admire most about Deakin is that I can listen to my lectures online through CloudDeakin. All of the lectures are recorded and available to be used through CloudDeakin which is helpful if I ever fall behind. Studying at Deakin has been an invaluable experience, and it has taught me how to develop my thinking and to take everything into consideration Another thing I love about Deakin is the number of events that happen on campus, and the number of student societies you can join. Deakin holds a Twilight Festival every year which lights up the night sky with fireworks – it was mind blowing! I also joined the Deakin Sri Lankan Students Society which made me feel more at home, introducing me to new people with different personalities. The events that the Deakin Sri Lankan Student Society organised over the past few months were spectacular. And obviously being a Sri Lankan makes you fall in love with the game of cricket, so I joined the Deakin Waurn Ponds Cricket Club and played in the first’s team. My journey abroad has been both overwhelming and inspiring and my experience in Australia has taught me so much. It has taught me to open my eyes to various opportunities, and how to adapt to new relationships and acquaintances abroad. Wandering out of my ordinary range of knowledge has taught me that life may not generally go as planned but one thing for certain is that we will positively wind up where we are intended to be, and if life is a story, why not make it an experience worth telling. Having grown up on a cropping property in the West Midlands of England I have always had a passion for agriculture. After spending 2 years working in a contract mustering team in Northern Australia, I recognised the diversity and scope in the agricultural industry. After realising the vast range of job opportunities, the agricultural industry in Australia had to offer me, I began to research means to expand my skills, knowledge and education of Australian agriculture which is how I came across Marcus Oldham. Marcus Oldham stood out instantly as the superior agricultural tertiary educator in Australia after meeting some of the alumni across the country. The practicality of the course and the use of industry placements allows students to apply the knowledge throughout the course and explore various sectors. This was the element of the college that I enjoyed the most. The Marcus Oldham experience gave me exposure to many different sectors of the industry, this has allowed me use my industry placement to work in several areas that I had never even considered. The network that is provided by the college has also been invaluable in developing knowledge in the Australian agricultural industry, from fellow students, alumni and company contacts. The culture in Australia and within Marcus Oldham is one of the main reasons why I enjoy living in Australia. The comradery within the college itself is a direct reflection of the country’s ‘Can Do’ attitude. Fellow students have a wide range of backgrounds and experience providing an environment where I have not only learnt from lectures but fellow students. Studying abroad has allowed me to not only learn more about the agriculture industry but it has allowed me to travel within Australia and to countries close by that would usually be a significant distance! I am currently studying 3rd year agribusiness and hope to become involved in the beef industry, my industry placement allowed me to gain valuable experience that will put me in a good position to achieve this. Studying abroad allows you not only to learn from the educational institution but from the culture, allowing you to get a learning experience that is completely unique. Come and visit Australia and spend some time in the Australian agriculture industry, its diverse, exciting and progressive. Not to forget there are some pretty good sights to see! As far as we know, Australia is a multicultural and multinational country in the world. The Australian education is pretty distinguished and it has too many advantages so that it can attract more and more people to come to study the knowledge they like. As an international student from China, I will narrate my many interesting experiences and my feelings for Australia. So why didn't I choose the other cities in Australia but I selected Geelong? When I lived in China, the pressure of every senior high school students is very heavy. To finish my homework, I had to go to school at 6:50am and go to sleep at about 1:00 in night. So I produced an original thought-go abroad to explore a new life which is both relaxing and I can learn some utile knowledge. In my opinions, I checked some cities and towns in Australia and learnt about the information of cities. Among the cities, when I saw the beautiful sceneries and colourful cultures, I fell love in the interesting town, Geelong. I was absorbed deeply by the environment and the enthusiasm of the people. A new journey for me has extended! With curiosity and excitement, I got off the airplane and observed everything surrounding me. What a beautiful city! What a great way! With the tender sunshine, I saw the wonderful view in my sight. Cool and refreshing sea wind fanned my face, the feeling was like in the fairyland. The wide blue sea was like a big piece of mirror even can see all kinds of fishes were swimming. Geelong-a glamorous place. It takes too much invaluable memory to me. I am studying in North Geelong Secondary College and I can choose more types of classes which I am interested in. I have made friends with many people including the teachers here. They are always very amiable and if I feel bored and helpless I always make a conversation with them to release my pressure. I still remembered that when I came to GEELONG initially, I even couldn't speak with the other people mainly because my English was too weak and I didn't want to talk something. When it was difficult to deal with the problems, there were too many people to encourage me to inspire my confidence and talk more with the others. I felt the care and warmth from my friends and determined to practice my English. Now, doing some sports with my friends is my favourite, meanwhile, practising my English is still the most important assignment. Talking some difficult problems with other people, watching some interesting English movies can help me how to utilize and comprehend the grammar and the vocabulary. I always listened to the customs, life as well as history of Geelong. I love the sea scenery of Geelong and almost not any contamination. With the warm sunshine and blue sky, that is a great picture! Geelong is a very wonderful town! The location is very special because it is near many interesting places and when I have time,I can go to play with my friends and family. The simple and honest folkways are the other special traits. On the other hand, it is very near to Melbourne-the cultural centre of Australia. But Geelong has the unique quiet and it makes people very comfortable rather than the noisy of Melbourne. In Geelong, I can't find any trouble in everyday life, only relax and happiness. I love Geelong! It is my new favourite hometown and I never forget it. Never! “I am happy I made the Gordon Institute of TAFE my study destination; I could not have had it any better. Being a TAFE, I felt the practical approach and real experience would help me further my studies and career path. The teachers are a great asset. The amount of care and attention they provide exceeds expectations. I go to class every morning knowing that I have their full backing and support. Lessons are broken down into very simple and concise parts, our nursing labs are fully equipped with state of the art tools and our lesson plans are set up to match the current needs of the workforce. G'day Mates!! I’m Amber Robillard from Canada. As I am writing this it has been exactly one year since I boarded the plane headed for Australia. It doesn’t seem possible that everything I have done could be packed into just one year! In the winter of 2013, my partner Barb and I started discussing the possibility of living somewhere warmer year-round. Australia was on the top of the list, but seemed very far away, however, the more we talked about it, the more appealing it became. What an adventure! Ayers Rock, the Australian outback, living by the water’s edge, surfing! Barb had always thought about living here and I had always wanted to visit. To be truthful, although I love to travel, I had never considered living long-term anywhere other than Canada. I have always worked in and around the construction industry, having completed a Certificate of Construction Management. I wanted to further my education with a Bachelor of Construction Management (Honours) degree. The prospect of living and studying in Australia was very exciting. We began making plans. I had quite a few names on my list, but in the end I only applied to three universities, with Deakin as my first choice. It seemed to be the most progressive university, making its way up the list of various university rankings and the accelerated study opportunities were appealing. I boarded the plane in Ottawa, Canada on 27 June and landed in Melbourne on 29 June. With delays, customs, running for gates, many movies and a trip across the International Date Line, my travel time totalled 31 hours. A long way from home, although it was made easier thanks to Skype! I only applied to three universities, with Deakin as my first choice. It seemed to be the most progressive university, making its way up the list of various university rankings and the accelerated study opportunities were appealing. My first trimester at Deakin was both challenging and rewarding. As a mature student returning to study, I hadn’t written a report or an essay in almost 20 years; however, professors and other students are readily available on online discussion boards. Recognising that starting in trimester 2 may introduce some unique challenges, Deakin staff and student volunteers held a tea meet-and-greet, for further support and chit-chat. After settling in, I continued my studies in trimester 3 where I chose to study one unit on-campus and two units wholly online. As it turns out, not having a full unit load right off the bat worked to my advantage. It allowed me the time to adjust to my surroundings and negotiate studying again. Trimester 1 of my second year proved that a fourth unit really tips the barrel. Deadlines become tighter and spare moments fewer. My time-off is saved mostly for school breaks and planned adventures. Geelong is a great city for things to do, a short trip to Melbourne and down the coast from many adventures. Eastern Park, the Botanic Gardens, the Barwon River trails, Pako (Pakington) Street and the downtown core are all places we love and frequent. We have enjoyed the Night Jar Festival on Friday nights in February and hiked along the Great Ocean Trail during our trip to Anglesea, where we saw kangaroos for the first time. We have also biked the Bellarine Rail Trail to Queenscliff, with a side trip to Point Lonsdale. We love these little surfer towns, with the blue sky, surf and sandy beaches as the backdrop. 42 degree weather for Christmas is also a good thing, as is a feast of seafood! In March we bought a little car and set out for the Twelve Apostles. My first time driving in Australia was made all the more adventurous thanks to the narrow, twisty Great Ocean Road! Over Easter we ventured to Bells Beach to take in the Rip Curl Pro tournament and caught some great photos of professional surfers Mick Fanning and Jordie Smith during their free surf. We have since watched every event online and have become avid surfer wannabes, although stand-up paddle boarding may be more our speed. With all this talk of travel and adventure, it seems I have had no time for uni! But thank goodness for the breaks! The breaks represent a chance to step back, have a real look at the amount of work and learning that has been packed into eleven weeks and not worry for almost a month about deadlines and presentations. Deakin also understands how important a break is and hosts events throughout the school year, offering students a ‘breather’. Most recently, Deakin’s international students were treated to a day at Simonds Stadium to meet some of the Geelong Cats (a popular Australian rules football team), tour the stadium and run through some typical footy training exercises. This was topped off with a free ticket to the Cats’ exciting winning game against the GWS Giants, where I was given a scarf to fly the colours in support. Studying overseas for four years seems like a long time at the starting line, but I am already halfway through my second year and the bachelor’s degree at the other end is getting closer with each submitted assignment. I have enjoyed every day in Australia, and as much as I look forward to the breaks, I also look forward to heading back to class and keeping the momentum going. The opportunity to study abroad was too difficult to resist when I was offered a place at Marcus Oldham College to study Horse Business Management. Horses have been my greatest interest since I was young. Studying at Marcus Oldham has provided an unforgettable educational experience for me to study and stay in a foreign culture. Australia’s culture is a totally new experience for me as I have grown up and live in an Asian country. I will always remember and appreciate all the assistance, guidance, care and warmth from the staff at Marcus Oldham. As an international student, I felt they were attentive to the welfare of a foreign student and always willing to go the extra mile. The experience at Marcus Oldham has also compelled me to be highly independent, especially when it involved looking after a horse that I leased from the College, going to equestrian competitions and finding and arranging practical work placements. While studying abroad, I enjoyed the opportunity to discover a totally different culture, meeting local and other international students as well as working on horse properties in Australia and New Zealand. After completing studies at Marcus Oldham, I worked in the Equestrian Centre at Penang Turf Club as an Administrative Executive and teaching basic riding lessons to beginners (after completing the introductory riding instructor’s course). Currently, I am the Racing Officer (Head of Department) at Penang Turf Club. If you are thinking of studying abroad, take the opportunity when you have the chance. The experience of studying abroad is absolutely remarkable. I will forever cherish the wonderful memories attained at Marcus Oldham. Hello，I’m BoRui Deng. I‘m 16 years old and I come from China. Now I’m studying in the North Geelong Secondary College. My “Australian parents” are Ali and Sef. Both of them are Iranians. They give me a good care. I also help them as I can. We became a family, not just a landlord and a student. The place which I am living is close to the beach. We have two cats and one silly dog（always brakes my clothes. When I got to the house, I was surprised the house was so nice. I ‘m very lucky to live with them. Some people asked me why I chose Australia, Geelong and NGSC. Australia has a beautiful and unique nature and it also has a safe social environment. People are kind and welcoming. It’s a good country to live and study. When the study abroad agencies asked me which city you want to study, I said Melbourne, because I have been to Australia on 2014 and went to many state capital. I thought Melbourne was the best city to study.When the study abroad agencies gave me the school introductions, located in Melbourne and near cities, I saw the introduction of NGSC. That was the first time that I learnt about Geelong and NGSC. 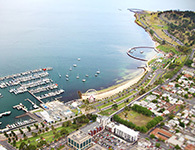 As I researched the information about Geelong, I got to know that Geelong is quiet and peaceful city. Geelong also has many beautiful views likes the beach、forest and high mountains. The left picture is Southern Ocean and the right mountain is called The You Yangs. I have been to there. That is lovely，isn’t it? The main attraction for the North Geelong Secondary School is its teaching resources: good facilities, intelligent teaching methods, excellent teachers and caring for students. When I first came to school ，I faced many difficulties，such as hard to understand what the other people said strange classmates, different teaching style etc. Luckily some students and teachers gave me a hand, especially Mr. Dawson and Mr. O. They are taking a lot of care to me and gave me much help，like my parents. I am very grateful for them，I will never forget. Some people ask me if I have any advice to future international students. Yes，I just have two pieces of advice. First, don’t be shy to talk with other people. It’s the best way to practice your English and make new friends. If you have any problem that you can‘t solve, just ask other people. They will be glad to help you. If you don’t say anything，everyone will think you are fine. The another one is study hard. Some international students become lazy after they come to Australia，because the school is easy and has more freedom than their country‘s schools. Never be undisciplined，it’s very important. Remember，you come to Australia for study. I hope I can meet you in NGSC. “I chose to study at The Gordon as they have an excellent reputation, with a lot of great chefs who have graduated and now own their own restaurants. All the teachers are professional and experienced and they make the training interesting and memorable. I have not only learned how to cook a great meal, but also learned how to be a team player. After studying with my classmates all year, we have become like a family. We study from each other, help each other, and have a lot of fun. As an international student I was always shy to speak out, but in the cookery industry you have to communicate with others and my English has improved dramatically. I’ve not only learnt English, but also some specialised words in French, Italian, Japanese and others. Being born into a poor farming family and growing up in a rural area in southern Thailand, I never thought I would have an opportunity to travel abroad. Before I heard of AusAid, the fully-funded scholarships by the Australian Government for students from regional Thailand during the mid-1990s, my dream about the future was never anything bigger than having an ordinary job in my small hometown after getting a bachelor’s degree from a local university. I applied for an AusAID scholarship as soon as I was informed of the opportunity. I went through all the screening tests and all the required application processes, and was finally awarded a fully-funded scholarship to study an undergraduate course at an Australian university. Receiving an AusAid scholarship was just the beginning of my life-changing journey. My first few years as a foreign student was not as smooth as expected. I struggled a lot with both the different culture and the English language. As a result, my academic performance at my first university in Australia was less than satisfactory, and I was very nervous that I might have to come back to Thailand empty-handed. However, I was very fortunate to be given another opportunity to study in Australia. This time, studying a bachelor’s degree at Deakin University. I finally found subjects of my true interest and I am forever grateful for that second opportunity. With lessons learnt from my previous course at the first university, I realised that I would have to do my absolute best at Deakin, not only for myself and my family, but also for my kind sponsor who did not give up on me. The course structures at Deakin are very well organised. The unit guidelines helped me tremendously, to plan my study throughout the semesters. My attention was focused on studying and I devoted my time to attending lectures, working on the assignments and projects well ahead of the due dates. My efforts were not in vain. My academic results at Deakin were satisfactory and I managed to graduate with a bachelor’s degree within the timeframe allowed by the AusAid programme. My degree equipped me with a very strong academic foundation in the technology field. All the assignments from my degree undoubtedly enhanced my analytical skills because some assignments involved long, complex and intricate calculations, as well as applications of theories in real-world practice. Participating in many extracurricular activities during my years at Deakin has also improved my self-esteem and self-confidence. Participating in many extracurricular activities during my years at Deakin has also improved my self-esteem and self-confidence. After graduating from Deakin, I joined the Thai Customs department when Bangkok’s new international airport, Suvarnabhumi Airport, was opened almost 10 years ago. I passed the screening tests and became a new customs officer – one of the few chosen applicants out of over 100,000 people applicants at that time. As a customs officer, my main duties include inspecting imported cargos. Inspecting a variety of products imported into the country is a very challenging task, however, the skills I learnt at Deakin has helped me to understand and examine the products effectively. The lessons I’ve learnt from my studies at Deakin and my experience living in Australia has definitely helped with my career. The lessons I’ve learnt from my studies at Deakin and my experience living in Australia has definitely helped with my career. Customer service skills is also very important in my job because we serve a lot of customers from different nationalities each day. Having spent a few years with international friends at Deakin, it has become my nature to be friendly and to approach people with an open mind. My English skills have also been a very important factor for my good performance and continuous career growth as a customs officer at a big international airport. With my bachelor’s degree from Deakin, together with my good performances at work, I have received a great opportunity for postgraduate studies overseas. I have been awarded another fully-funded scholarship from the Thai Customs department to take a master’s degree in the field of operations research, which is essential in promoting improved operations and services provided at the Customs department. I have confirmed my enrolment at a university in the UK, where I will go for my master’s degree next year. Without my bachelor’s degree, my experiences living in such diverse cultural settings, and all the lessons learnt during my years at Deakin and Australia, I wouldn’t have this day.